A moving piece of Nelson's history! A big thank you to the Nelson and District Credit Union for helping make our Canada Day a huge success. With over 300 people visiting the Museum and over 1,400 riding Streetcar#23 this day was exciting. We look forward to hosting this event again next year. See you on the rails! Smiles on Canada Day! Free Rides, Free Museum Admission and Free Smiles for Everyone. Nelson BC, A beloved tradition continues this Canada Day. 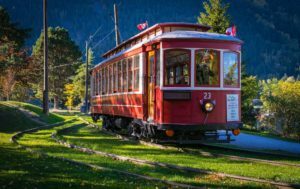 For five years the Nelson & District Credit Union (NDCU) have been making a donation to the Nelson Electric Tramway Society (NETS) for free rides on Streetcar #23 and admission to the Trolley Barn Museum. Our whole community benefits and the fun is measured in smiles. When Nelson folk see Streetcar #23 rolling out for the summer season they swell up with pride and happiness. Some see over a hundred years of heritage rolling down the waterfront, like a living postcard. Others enjoy riding on a piece of history. They just love hearing it creak, chug, clank and squeak! For everyone the result is a smile, easily achieved and priceless to share. This year NETS is working with the NDCU to bring even more smiles to Canada Day. Streetcar #23 and the Museum will be open for extended hours. Watch for fun surprises at the Trolley Barn. 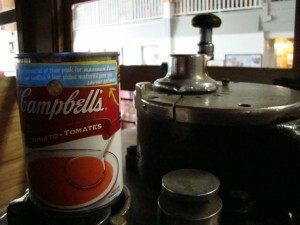 Every year the Museum grows with additional treasures from local residents. It is always changing. Along with the Birney Car 400 there will also be some classic vehicles on display. 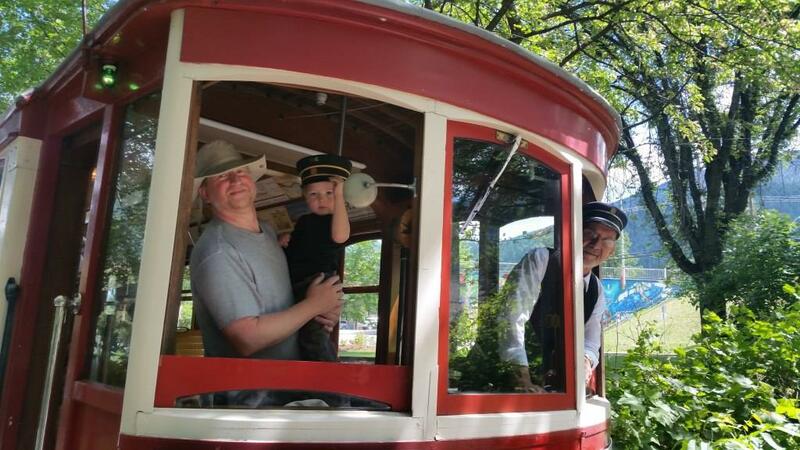 Once again this year, at the July 1 Canada Day Celebration in Lakeside Park, there will be free rides on Streetcar #23, and free admission to the Trolley Barn Museum. Offer thanks to the Nelson & District Credit Union and the Nelson Electric Tramway Society with a wave and a really big smile! Here driver Stu Griffett and his son Lake are getting ready for Father’s Day. See you on The Rails Happy Father’s Day! Season 2016. We are open for rides 7 days a week from now until Thanksgiving and you can see our schedule here. 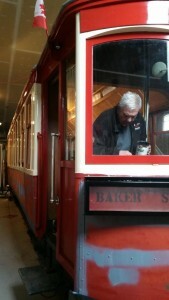 This year while the tracks were quiet the volunteer crew spent over 2000 hours refurbishing Streetcar#23. One of the new features is room for a wheelchair and increased access to help those with limited mobility, we are still however working on creating wheelchair access to the Streetcar…a project we are currently focused on. With the seats redone, the car repainted and trucks/shoes…it feels like a new Streetcar! Thank you to all that helped make it happen. We have plenty of fun and events planned this year so we look forward to seeing on the rails. Nelson Gets a Brand New Streetcar? The Nelson Electric Tramway Society (NETS), that run Streetcar#23, have been very busy since the end of last season. But before we talk about the new streetcar, let’s get caught up. Walk and Jim take in the donations on our annual Fill the Birney food drive. For the second year we have attempted to fill Birney Car 400 with donations of food. This annual event is about giving back to the community by giving free rides for donations that are distributed to all of our local food charities and this year was huge success. We brought in more food than last year and many local businesses were very excited about getting more involved in 2016. Thank you to Save on Foods, Safeway, The Co-op Country Store, The City of Nelson and everyone else I may not have directly mentioned…Thank You! Yes it is that time of year again, our annual general meeting, come and get involved, or find out what is in store for the 2016 year. It is April 5th, 2016 at 7:00pm upstairs at the NEW Chamber building in the train station. All are welcome! Learn more about how you can volunteer to Drive, Host and Help. For more info call 250.352.7672. 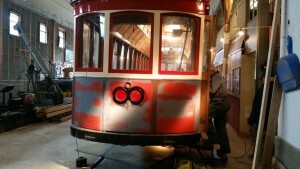 OK, it is still Streetcar#23, the original, but she needed maintenance and sometimes it can be very extreme. 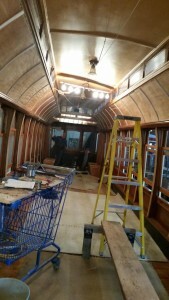 This year from Oct to Jan over 1,000 volunteer hours have been put into dismantling, re-engineering, rebuilding, refurbishing and detailing Streetcar#23, when she rolls out of the Barn in May, it will be like Nelson got a brand new streetcar. We are scheduled to open on Friday May 20th, the Victoria Day long weekend. Be the first to ride on the New Streetcar#23. There will be free rides to people in Heritage Costumes. For more information please call us at 250.352.7672. Nelson BC, The Nelson Electric Tramway Society (NETS), operators of Streetcar 23 and Birney Car 400, are planning their second annual Food Drive this Saturday October 3rd 2015 from 10 am to 5 pm in an effort to raise much needed non-perishable food items as well as cash donations to help the less fortunate to cope with day to day challenges. 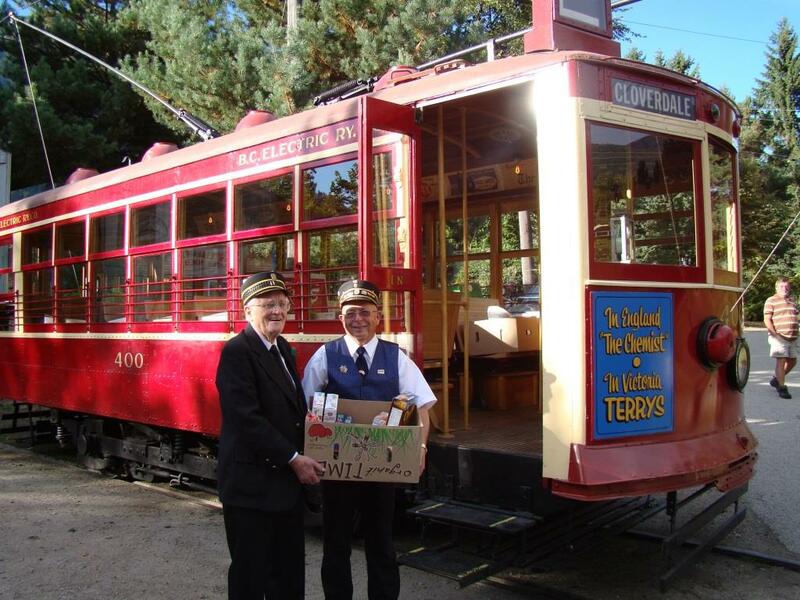 The Food Drive has been named “FILL THE BIRNEY CAR” and each donation would permit the Donor to unlimited free Streetcar 23 rides, as well as an admission into our newly constructed Museum and the chance to win some fabulous prizes donated by local businesses. This year the Fill the Birney Car will be on Saturday October 3rd from 10am to 5pm. We look forward to seeing you there. 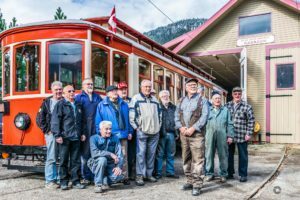 The Nelson Electric Tramway Society (NETS) are ready to officially open their latest project, the Car Barn Museum. On Monday August 3rd they are inviting the entire community to come on down from 11am to 4:30pm with free streetcar rides and Museum admission.. At 1pm there will be a special Grand Opening Ceremony with ribbon cutting, tours, cake, refreshments, classic cars and special guests. NETS have been working toward this goal ever since they rolled out Streetcar #23 in 1992. The idea was to create a working museum of Nelson’s History. The first phase of this project was to get Nelson’s original streetcar operational and then over time create additional opportunities to enrich and educate the community. The goal of NETS recent history was to create a dedicated space for displays and historical artifacts. Over the past two years the Car Barn, with the help and love of volunteers, has been renovated to include a dedicated museum space and displays throughout the barn. 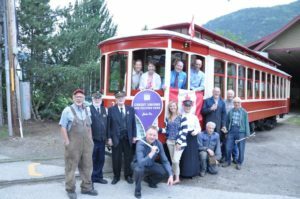 Over the years, many artifacts and photos have been entrusted to the Society by community members who wished to keep Nelson’s streetcar heritage alive for future generations. The Museum project has given the society an opportunity to present these items to the public. The artifacts are now housed in a dedicated museum space with additional equipment displayed throughout the car barn. On Monday August 3rd everyone is invited down to celebrate the grand opening of the NETS Car Barn Museum in Lakeside Park with free admission to the museum and free rides all day on Streetcar#23. 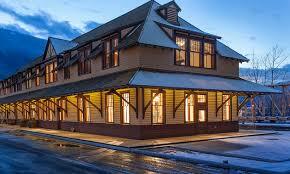 Events start at 11am with tours of the museum and car barn and a special ribbon cutting ceremony at 1pm. 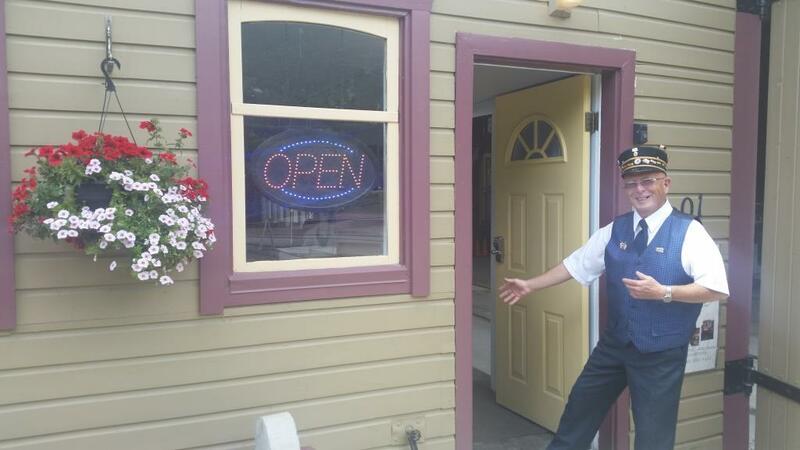 For more information call 250.352.7672, info@nelsonstreetcar.org or come on down and visit them in Lakeside Park, right beside the soccer fields and next to the Nelson Rowing Club. The tracks are clear and the power is on…Streetcar #23 is running on schedule this Canada Day. Thank you to all the helped make it happen! Come on down to the Trolley Barn to check out our Canada Day Exhibit with extended Barn Tours, Museum and Birney Car 400. We look forward to seeing you down here and wish you a Happy Canada Day! Nelson BC – Last night Nelson experienced the storm of the year, decade, century as trees all over Nelson were blown over. Power in the City was out for most of the night, but it was the devastation in Lakeside Park that has hurt us most. There is a tree down on the Car Barn, there is no power and about a dozen trees all over Lakeside have fallen. We still need to asses the damage to the wires and also see if there are any trees down along the tracks. #1 Streetcar #23 will not be running today (Tuesday June 30TH) and we will update the web and Facebook when we are up and running. #2 Grab your gloves and come on down to the park. Yep we need some help getting cleaned up after the storm and could use help. We will keep you updated and let you know our progress by the end of today. See you under the trees….on the rails. 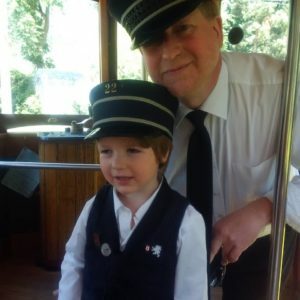 this Father’s Day by inviting all Dads and Kids for a free ride this Sunday June 21st. You can also get a tour of the Car Barn and check out the new displays in the Museum. The new attraction that the Streetcar Car Barn Tours and Museum brings makes an excellent addition to a ride along the water front from downtown to Lakeside Park. 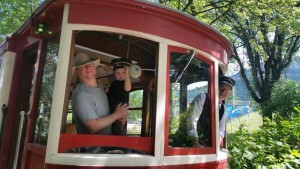 We look forward to welcoming all Dads and Kids on board for a free ride this Father’s Day Sunday June 21st. 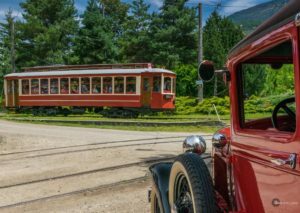 Also stay tuned – July 1st The Nelson and District Credit Union has sponsored free rides for the entire day and the Tramway Society are planning a big display in the Car Barn and the Museum. The Pioneering Spirit of Canada Day is still alive at 150!